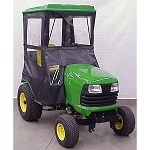 Need to find a local Original Tractor Cab dealer? Enter your ZIP code or full address, and choose a search radius to limit results to those within a certain distance of your location. Results will be shown on the map. Alternately, you can allow our website to know your location, in which case the map will zoom directly to your current location as reported by your Internet Service Provider. Please note that the automatic detection may not work if you're using a VPN (if it doesn't, just enter your address manually). We at Original Tractor Cab are eager to serve you and happy to answer your questions. Please call us at 800-247-5305 if you need more information!